Since joining Bayer Becker in 1993, Chad has served the company in several capacities. He first started his career as an instrument man on a Field Crew and then progressed to Crew Chief, Field Crew Coordinator, CAD Technician and Designer. He has extensive experience collecting field points and control, for aerial surveys, base maps, and topographic surveys. He is also skilled at creating 3D computer base maps, topographic maps, and surfaces using points collected in the field from multiple sources. Currently, as IT Leader, Chad focuses on the direction of technology for Bayer Becker, including user up-time and efficiency by planning, implementing, and maintaining current and new technologies. Additionally, he researched, designed, and custom constructed our hexacopter platform specifically for Bayer Becker’s UAS service needs. 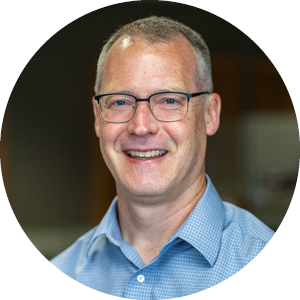 Due to his extensive background, Chad’s strengths consist of the ability to learn and teach others, visualize the connectivity of different parts of the business to solve large complex problems, and resourcefulness in adapting to unique situations. Chad grew up in rural Clermont County, where he currently resides with his wife and two daughters. When he’s not in the office, he can be found doing something fun with his family, hiking, camping, or running. He also enjoys trying all styles and varieties of good craft beer and spends part of his free time volunteering with his church, assisting with technology and audio/video.